The Grateful Dead Movie Soundtrack isn’t the first attempt to encapsulate the Grateful Dead’s 1974 "farewell" concerts at Winterland Arena in San Francisco, but it is a vast improvement over Steal Your Face, the hastily constructed and jarringly uneven double-LP collection that in 1976 was issued to fulfill a contractual obligation to United Artists. Indeed, while the latter set had its moments, both the songs that were selected as well as the manner in which they were presented did little to further the band’s cause. The newly minted five-disc package that has been dubbed The Grateful Dead Movie Soundtrack, however, not only is something entirely different, but it also is utterly sublime. For the record, the Grateful Dead has been known quite infamously for falling apart when placed within a pressurized situation, and while there certainly are plenty of examples to support this claim — the frustrations of both Woodstock and Altamont, for example — there also are an equal number of illustrations to disprove it. True, the five shows that marked the band’s departing soiree in October 1974 contained some shaky moments — most notably, during the final send-off, which was performed under the heavy influence of psychedelics — but as The Grateful Dead Movie Soundtrack confirms, there were far more than just a handful of worthwhile highlights from these concerts. In fact, the audio collection is as essential as the film that inspired it. Beginning with the one-two punch of U.S. Blues and One More Saturday Night, the first disc of The Grateful Dead Movie Soundtrack initially follows the path outlined by its namesake documentary, but as it progresses, its affiliation becomes more loosely defined. While all of the tracks that appeared in the film are represented on the collection, they each are reinserted, at least in part, within the context of the concert from which they originally were taken. After the opening suite of songs, which compiles several exquisite snapshots of the band’s stage persona into a sparkling gemstone of sonic splendor, the rest of the albums in the set provide four distinctly different intergalactic travelogues: There’s a chapter that meshes the group’s propensity for jazz-permeated, deep-space freak-outs with the ominously heavy, cataclysmic thunder of The Other One; an installment that emphasizes its gracefully apocalyptic, but beautiful explorations of Dark Star; a segment featuring He’s Gone, Truckin’, and Black Peter that focuses upon the ensemble’s blues- and gospel-infused undercurrents; and an episode that stresses its percussive tribalism by fusing Not Fade Away with another wild romp through The Other One. Like many of the magnificent outings within the Grateful Dead’s extensive series of archival releases, The Grateful Dead Movie Soundtrack perfectly preserves the collective’s preeminently precise method of unspoken communication while leaving behind its self-admitted ragtag tendencies. By the time the band embarked upon its fall tour of 1974 — of which the Winterland shows were the culmination — its adventurous pursuits of unbridled, jazz-fusion-driven exploration were nearly at an end. Although its subsequent studio effort Blues for Allah, which was recorded during its hiatus, undeniably was shaped by these exploits, the sonic architecture of its later concerts reflected a different, more tightly-knit perspective. It’s here, then, within the concentrated confines of the extracts from the "farewell" shows that its dabbling in what Ornette Coleman dubbed "harmolodics" is most explicitly on display. To be sure, each of the elongated improvisational segments is a veritable showcase for the Grateful Dead’s slipstream spontaneity. On the rendition of Playing in the Band that concludes the first album in the set, for example, the group wove together a series of melodic elements, and whenever one instrumentalist’s thematic interlude dissipated, one of the other musicians gently caught the conceptual thread and carried it to its destination. Essentially, this is the aural equivalent of cloud-hopping, and scant few artists ever have been able to achieve this feat with such impeccable regularity as the Grateful Dead. Featuring six hours worth of material, The Grateful Dead Movie Soundtrack might appear, at first glimpse, to be a tad unwieldy for some casual fans to undertake, but the Grateful Dead’s variegated, multi-textural approach allowed it to cover vast expanses of terrain with magnificently stunning ease. Although there are numerous songs from its canon that are absent from the effort, all of the band’s tricks for transcendental transportation are given a chance to shine. Better than any of the group’s countless other multi-disc collections — many of which are superb in their own right — the package provides a flawless representation of the ensemble’s intrepid trips through the space-time continuum. 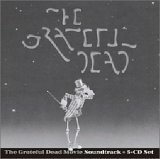 In other words, much like The Grateful Dead Movie is the epitome of the "Grateful Dead" experience, The Grateful Dead Movie Soundtrack is the quintessential audio collection of the band’s mind-bending sojourns, and miraculously, its sheer sophistication makes even the much-revered music of Live/Dead seem one-dimensional.